The Core series from Adam Equipment is the best choice for simple operation and economy. This video shows a basic overview of the Adam Equipment Core balance. Watch the video here. The Cobra 5003 is a research-grade gamma counter featuring a single 3 inch NaI through-hole detector, 2000 KeV energy range and 750 sample capacity. System includes new LCD Display, new Epson printer and all accessories. Optional instrument cart is also available. System is guaranteed to meet original manufacturer specifications, including detector efficiency and crystal resolution. We also offer installation, training and extended warranty options for most locations. With iDri™ Technology, an advanced analysis process that can accurately determine the moisture, solids, or volatiles content in as little as 60 seconds and One Touch Technology® methods, available for download in the Resource Library, results are available in record time. 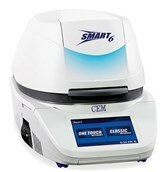 Read more about the SMART 6 on the CEM website. I'm using an Edwards nxds10i on a distillation apparatus and we need to purchase another pump. I want to keep the vacuum oil-free but think a diaphragm pump could work. I can't find a diaphragm pump that achieves <5torr but have read that they exist. Has anyone used a diaphragm to replace a dry scroll at low vacuum? Advise this member. I have a Q-Pod that does not dispense. When I press the trigger, the main unit does not switch from "Ready" to "Dispensing". Looks like the main Integral unit does not get the signal from the Q-Pod to dispense. However, both do happen if I use the foot switch to dispense water. Do I need to replace the entire trigger assembly? Does anyone have a part number? Advise this member. VirTis/AdVantage 2.0 - Lower limit temp. The Virtis Advantage 2.0 XL freeze dryer does not achieve the lower limit temperature specification at the shelve and at the condenser. It only drops to - 39oC in the condenser and to -30oC at the shelf. It seemed it was a problem with the refrigerant. Does anyone knows if the refrigerant is responsible for this? I would appreciate information. Advise this member. Click here to read more from Deltech Furnaces. The ProScan® III system from Prior Scientific provides a flexible, high performance control system for Prior microscope accessories including motorised stages, focusing devices, filter wheels, illumination devices, shutters as well as robotic sample loaders for well plates and slides. The ProScan III is designed to be versatile and simple to use, yet capable of automating complex microscopy applications that demand the very best in precision and accuracy. Read more. The SKYSCAN 1275 software features 2D/3D image analysis, as well as a realistic 3D visualization that employs recent developments in reconstruction algorithms, accelerated by new powerful graphics cards to give an additional gain in performance and speed. The outcome is the rapid and realistic visualization of results by volume rendering. Fabulous images of the internal microstructure of an object reveal details by virtual cut or virtual flight around and inside the objects. Read more. One of the key enhancements of the new release is “Optimized Corrections,” a breakthrough patent-pending technology that performs a computationally complex set of corrections on all query and reference spectra in a search to find the optimal match between the query and each reference spectrum. Multiple corrections are applied automatically to compensate for differences between spectra caused by the variability of different instruments and accessories and other factors including human error. Read more. Capacitors on board #3 look fine. I need help to fix this problem because the board is obsolete. Join this discussion. Our lab got an early-80s model Sorvall RC-5B ultracentrifuge last year (used, obviously) and so far we've not been able to get it to actually spin. Join this discussion. We have a Beckman Coulter Avanti J-26 XP in our lab. Last Friday it gave the error "sys" when we switched it on and it was not possible to delete it by pressing "clear". Join this discussion.